Rover’s intention in Group B was to prove that a naturally-aspirated (non-turbocharged) car could be equally competitive as a turbocharged car. Rover payed Williams Grand Prix Engineering to build the car, since Rover didn’t have the same amount of money as Lancia, Audi, etc. to produce a competitive car. The car was mid-engined, and the engine was a 3-litre, 24-valve V6 that put out about 400 horsepower. It had four-wheel-drive, and it had the radiators mounted in the rear as well. 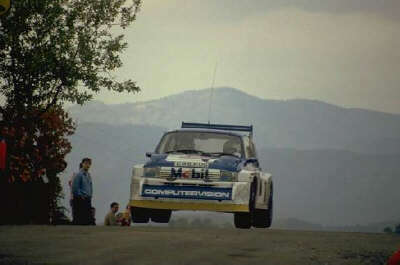 It also had large spoilers to aid with downforce; the wings were one of the more successful innovations introduced by the 6R4. The rally program during Group B wasn’t very successful, mainly because of a lack of funds. Ferguson-Formula viscous coupling eliptic center differential. However, the project certainly wasn’t a complete failure. The car’s biggest success was definitely its international debut, when the 6R4 captured third place in the 1985 RAC rally, behind the all-conquering Lancias. The 6R4 is popular among rally car collectors, and it is still very successful in rallycross and in the British rally championship. The Metro developed for this kind of competition was code named the 6R4, and was a mid-engined four-wheel drive saloon, which beared a resemblance to the Metro although it was actually built on a Maestro floorpan! The engine was a V6 unit which had been derived from the Rover V8 engine which has been seen in numerous vehicles including the MGB. The engine had effectively had two cylinders removed, was fuel-injected, and had been mounted in what would have been the back seats of the Metro model. This whole package was offered in limited production, for homologation purposes, at a price of around 25,000 pounds and as low as 13,000 pounds in the early 1990s! Are you in a Group B Rally Fan Page?